Testify the half order convergence of MC through a numerical example. How many ways can you give to construct the uniform distribution on \(S^2\) . Implement them and make a comparison. pick \(u=cos\phi\) to be uniformly distributed on \([-1,1]\), and \(\theta\) the same as above. Marsaglia (1972) derived an elegant method that consists of picking \(x_1\) and \(x_2\) from independent uniform distributions on \((-1,1)\) and rejecting points for which \(x_1^2+x_2^2\geq 1\) . From the remaining points. It’s obvius that the method c is the most effient, but not stable. a: Elapsed time is 0.026833 seconds. b: Elapsed time is 0.020886 seconds. c: Elapsed time is 0.006588 seconds. PS: I. 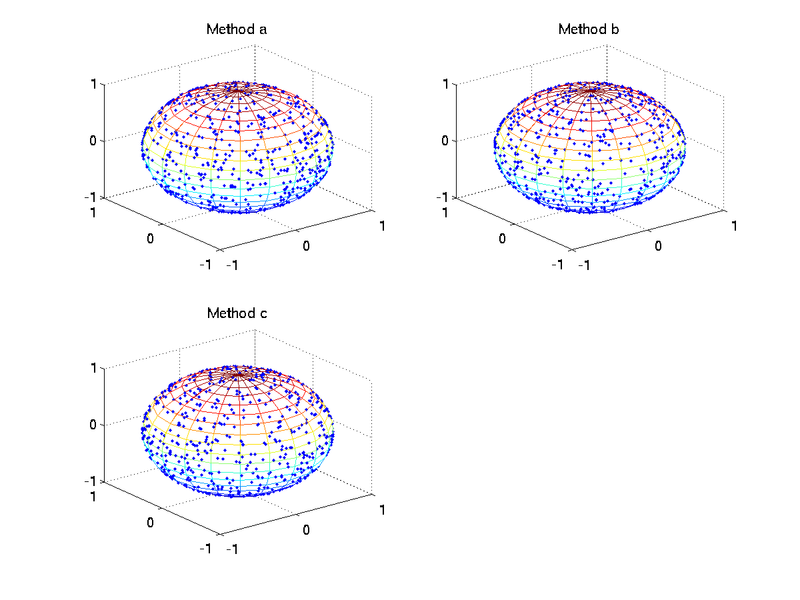 Another easy way to pick a random point on a sphere is to generate three Gaussian random variables. #. Cook (1957) extended a method of von Neumann (1951) to give a simple method of picking points uniformly distributed on the surface of a unit sphere. This method only need multiply add, sub and divide.